Description: A beautiful and exotic work of art. This circular shaped design bar stool is made from iron, and covered with rich leather. Description: Truly a stunning display of unique design and intricasy. 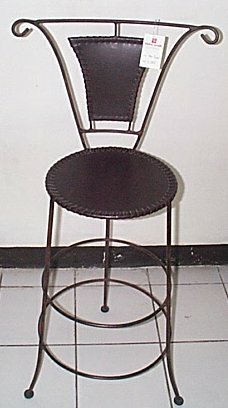 This gorgeous bar stool is made with iron and leather, with the back of the stool being forged in a "V" shaped design. Description: This iron and leather chair will certainly be an attention getter in any home. 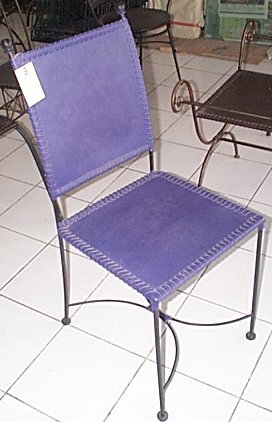 Covered with purple dyed leather over a wrought iron frame, this lovely design is certainly an eye catcher.